So yeah the word passion evokes different responses, depending on the context. For those with filthy minds, take a moment if you need one haha. For me, and I'm upfront about it, passing on knowledge and watching others grow is best summed up as a passion. Still, it's very rewarding to get the occasional reminder when a trainee puts all the elements we've worked on together. That eureka moment when a chap reaches a point where he suddenly puts all the pieces together, and that old cliche about the end result being more than the sum of the parts comes to mind. Let's not get into names in this instance, for the rider I'm referring to started off at a modest level. In reality he's not that far removed from what is in some ways an average rider, predominantly commuting, not afraid of wet roads perse, yet take him onto the open road in the wet and the confidence level plummets. To explain this, let me go backwards. In order to approach any riding situation, the IAM uses Roadcraft of course, if you don't have a structured plan for dealing with what's coming at you there's a tendency to rely on luck. We all know this runs out eventually. Over a period of months I'd gradually worked on putting the structure in place for this chap, then came the opportunity to put these newly gained skills to use. A damp road with a variation in surface quality, in other words the ideal place to use SSV. It helped that I knew the route well, and that other traffic could scoot past if need be. As it turns out, my trainee surprised not just himself but also me! I'll be fair in that I used plenty of demo running to placate any residual fear in my trainee, so when it was his turn to take the lead, he seemed quite relaxed at simply using SSV to pick a sensible path thru the surface variations. Moderating the pace according to the situation was simply IPSGA at play. This particular ride was intended to be around 1.5 to 2 hours maximum. As my trainee was relishing his own accelerated learning curve, we took the opportunity to keep at it for a bit longer. The grin factor was there and watching him become smoother and faster, all in perfect control, was where that word passion comes to mind again. It's just cool to see someone take your coaching on board and thus make a quantum leap. The next outing with the above trainee, I began by building on the learnings from our previous run. This quickly led to a mid ride chat, and the finer points of throttle control. It was partly prompted by a remark made by my trainee about tyres. He was looking at his front tyre and remarked how the front had a lightly feathered feel to it, whereas his rear was smoother in comparison. Yes I'd noted this before. Then he looked at my tyres and found the reverse. This led to a chat about chasing the vanishing point along with throttle sense. In earlier rides I'd gotten him used to using lower gears to achieve good engine braking, then using this lower gear to negotiate a twisty section on the throttle and how this was much smoother as it kept the bike nice and stable. Time to dial it up a bit. The topic of neutral or positive throttle to enter the bend, then transitioning to a progressive throttle as we go past the tip-in point, which is depending on how quickly the vanishing point is moving away from us...was covered in chat, then by demo and finally letting trainee try this at his pace. Basically a repeat of the previous outing, the leap in confidence as the progressive throttle approach now made the bike feel more stable under more positive acceleration. Yes I'd covered this approach previously, but without getting stuck on it, for there were quite a few basics to sort out before spending some serious time on this. This then reminds us to simply follow the building blocks approach, for to use a building analogy, do we really want the roofing crew to turn up before the walls are up? Now I'll be honest, for at the initial assessment with the chap I've talked about above, I didn't expect him to reach this level of riding this quickly. But hey, as Geoff James pointed out at the time, just tailor the observed rides according to the ability of the associate and build on it from there. Surprise surprise, it worked. Some folks are just a sponge for knowledge I guess. Yes I should have drawn a parallel with work, for some guys start off at a basic level yet grow quickly. The reality was a little different though, and this was another reminder of what we, as IAM observers, consider an average rider. One of the items that stood out was the rigidity of the potential associates' positioning, so this had us transitioning to a demo ride earlier than intended, for it's about safety after all. Now it's too early to give a verdict on how this potential associate will turn out, but hopefully we'll have left him with a new found appreciation for the flexibility of the Roadcraft approach. 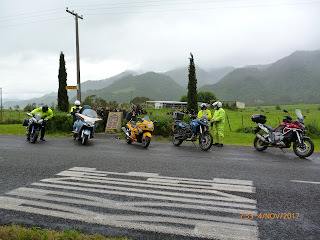 To follow on from the average rider theme, as part of my roaming the countryside for IAM purposes and various other social outings, I can't help but note the standard of riding overall is quite varied. Now let me be fair and admit that I'm not perfect myself. Right now I've got that covered, how would you feel if you've been following a guy riding a fancy bike, wearing all the right gear, but struggling to get around bends in a consistent fashion? On the odd occasion I'll end up chatting with a rider such as this, for I'll usually scoot past and be gone from him once the next few bends appear. Further down the road, be it a fuel/food/photo stop, this rider may want to know a bit more. For fellow IAM observers, this will no doubt have happened to you as well. So what's the right way to handle such a roadside question? Well, I can but suggest humility is the right approach. OK, I'll happily point someone to both Rideforever and IAM websites, but beyond that I try to refrain from it turning it into a "damn I'm good" session for that just turns people off aye? The importance to partake in social rides, to keep a sense of what constitutes an average rider is thus important, lest one slip into a mode of only riding for IAM purposes in some form or other. 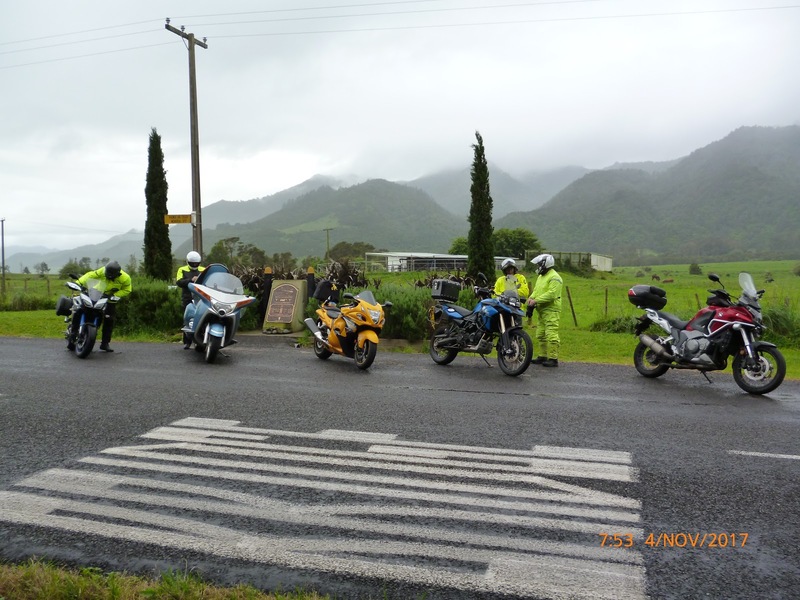 The pic below is from this years' 1000 km cruise, aka 1 KC, with 5 IAM members (including myself) starting off from Hamilton. The damp start, or first 300 odd km, was not ideal and slowed the pace considerably, but we nevertheless completed the day. 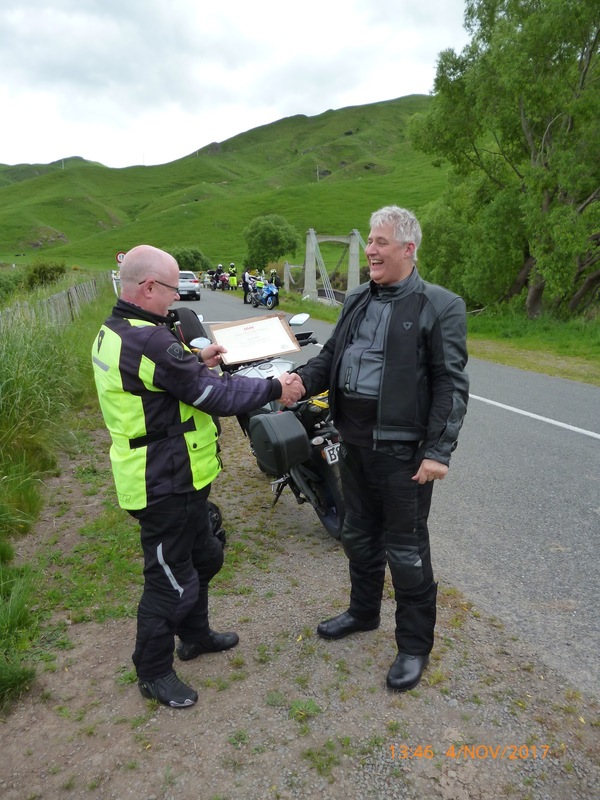 The above pic is Rex Stentiford being presented his IAM Advanced Test certificate. 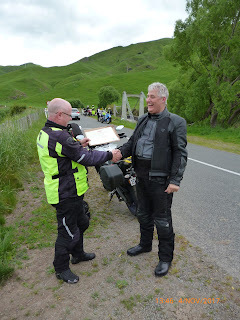 Yes I know it's perhaps a little odd, but I reckoned it was fun to give him his certificate at the old Rangitikei River bridge on the Gentle Annie, about halfway thru our distance on the 1 KC. The grins sum it up. I have subsequently been questioned on where I intend to present the next certificate...so this might be the start of a tradition, and why not? A very good post indeed Rob, not only for describing how well the flexible "building blocks" approach works so well for riders of differing abilities, but also the pleasure everyone gets from seeing an Associate improve out of sight. Also liked your comments on humility and ability. No need to say anything at all - just let riding and an ego-free approach talk for themselves eh? Nice one mate!